Klaudia Hartmanis was still unknown in the world scene of Freestyle Slalom one year ago, but she made quite an impression during the whole year, thanks to her fresh and energic style which is getting more original and mastered with time, and a good technical list which keeps on growing and getting more complex. The dedication she puts in her skating makes her a very promising rising star. She’s started to play with the big girls... with success already: She’s currently the World Vice-Champion in Classic Freestyle, and she’s currently ranked in the World Top-10 both in Freestyle and in Speed Slalom (6th and 9th). And last but not least she’s got the particularity to have offered Poland its very first world medal ever...! Not bad for a Polish teenager who was only World #61 twelve months ago! · What is your vision of freestyle-slalom: How do you describe your discipline to someone who never heard about it? 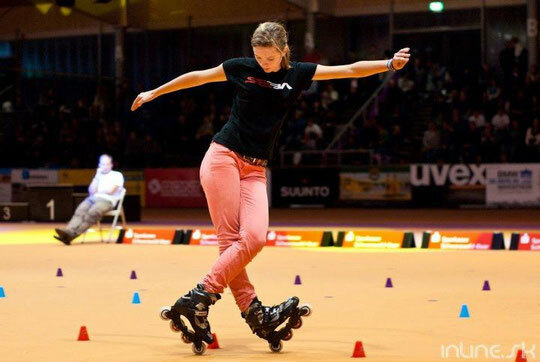 According to me, slalom-skating is more than a common discipline, because you can create your own style and show your own individual personality through skating. My definition of freestyle slalom is dancing and freedom of movements between cones, with music of course. There are some rules in competition which I should observe but I can also bring in a “piece of me “. Furthermore, thanks to that sport we shape our bodies, we become stronger and we develop our ambitions. However the most important is to have fun, enjoy skating and meet skaters from all over the world!! · How were you introduced to freestyle? I remember that I was playing some games with my friends like hide-and-seek. With our skates on it was faster and more attractive. It was also a great basis for my slaloming because I feel confident with skates. Then when I finished my primary school I was wondering which junior high school to choose. At that point, all schools advertise to attract their future students. One of them was organizing an “extreme” day competition for anyone who could skate, and my old school had invited all of us. Honestly I didn't want to go but my mum persuaded me. Thanks to this event I entered the 8th junior high school in Rzeszów.I went to this school because of one teacher was teaching skating! I also had heard that it was a good school - friendly teachers, and it’s a small school so everyone know each other and more! To sum up it was the best school for me. My first competition was Battle Warsaw in 2009. There I met leading skaters including Chloe, Seba, Igor, Xuan Le... I was watching their runs with fascination. They showed me that slalom is something AMAZING – style and difficult tricks combined with fun! · What are the key-moments in your evolution? - High school PowerSlide skates. I was in the Powerslide Team for a few months. 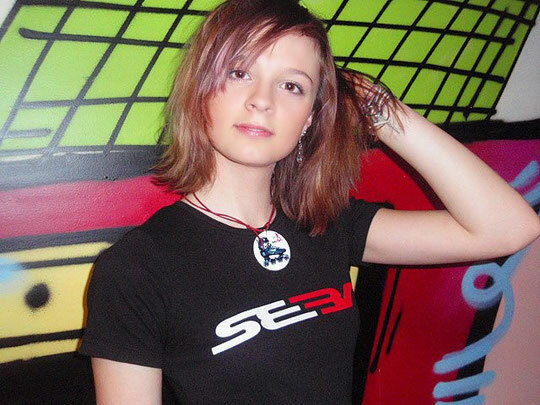 - And the key-moment was in October 2010 when I was asked to join the SEBA Team!! The Seba skates I like best are the iGoRs. Seba offers me huge possibilities to develop my slalom and makes my dreams come true. I can skate with high quality equipment and travel around world. In only one year, I met great people, visited and took part in a lot of competitions abroad. Definitely it was the best year in my “slalom career”! · What was the role of the media in your training? At the beginning, I was watching a lot of videos with tutorial tricks. They usually consist in a few points of view and slow motion. I'm convinced that it was an easy and helpful way to develop my slalom. I was also interested in competition videos. I could see and get to know better new combos and tricks, skaters' behaviours or atmosphere. It's sure that it's better being on an event than watching videos, but it's also a good type of experience. · What type of skater do you get your inspiration from? Personally I like a lot of skaters' styles. My perfect features for slalom are connecting a different, specific and particular style with dynamic and difficult tricks. Step by step I'm creating my own style including everything above! I was really motivated after the competition in Shanghai. There I saw Asian skaters who have no limits and do master tricks with lightness and smoothness! Were you aiming at the podium? Was it a surprise? I changed and improved my classic program after the competitions in Paris and London. I became attached to this music and run. I spent a lot of months training on it. But I didn't think that I'd be standing on the podium. Always when I go to some competition, I want to do my slalom so that I don’t regret it later. So no stress, have fun and keep smiling! I never think “I have to be 1st “. In my opinion it is more important to have fun than to go for the best results. Yes, it was big surprise to be 2nd because a lot of really Great girls were behind me. Yes, it's a huge honour for me. The best thing was the surprise I got when I came back to school. My class had prepared me a party during the History class! I received a big congratulation card with a lot of kisses and hugs. One of my friends even baked a cake – It was AWESOME!! :)) .. Moreover, Polish skaters were happy with my success too. Now people look at me differently. Because when people hear “world vice-champion” this changes their point of view. · What does your typical slalom-session looks like? It’s different in winter and in summer. The best period of the year is during the holidays because I have a lot of spare time. I get up early and go training every day. In winter when day is short I have less time. However I try to use it well. I usually skate 5 times per week for about 3 hours and more during weekends! In summer everything is easier: I can train everyday outside, which I do as long as I can because I always remember about school, which is very important too. I rarely train with my friend Magda Mosiężny, but I prefer training with Michał Sulinowski. When we’re together time runs very fast and we frequently skate for looong hours. The Junior high school's court is a good place for skating: it's big and located near my house. That's why we go training there most of the time. During a session, I try to do the most tricks I know... I generally connect them with style tricks so that I practise two things in one :) When I learn new tricks, after some time I change to another not to be bored. I think my training doesn't differ from other skaters' training. Maybe there is one detail: I never say that I can't do something!! I always believe in myself! · What is your next step in the mastering of tricks? Which ones? I'm working on wheeling tricks and combos. Sitting tricks on one wheel are really addictive too. Especially one wheel Christie! · What are your plans for next season? Do you already know all the competitions you will go to? I'm sure about Battle Warsaw and all the competitions in Poland. Apart from that Paris and the World Championship. I'd like to go to as many events as possible. It's difficult to plan things like this. All that I'm planning is to keep having fun and satisfaction. Moreover I respect organizers and other skaters, therefore I'm preparing to each event to show the highest level of slalom I can. How does music affects your skating? Do you need music to slalom? Why? Yes, of course I need music to train. I can't imagine skating without it! I usually sing because it makes me feel music in my whole body. Then acrobatics between cones are easier because my legs go by themselves. · Do you have other passions than freestyle? I’ve got a brown belt in Traditional Karate. I've been training for about 7 years. My coach was Marta Niewczas, a World Champion. Karate taught me to be strong, never give up and always play fair!!! It also gave me good basis to train slalom! · What do you do in your life when you are not skating? Charity work! Helping others if I can. I often join in some charity activity at my school. School and study, that’s the basis of my life. Every year I end school with distinction and have scholarship. In spare time, I love doing all sports volleyball, handball, basketball etc... I've recently started playing squash. In winter, snowboarding. I've never tried skiing so maybe this year? I want say thank you to Sebastien for the best support and for inviting me into the SEBA Team!! It's an honour and a real pleasure for me :) Thanks to my parents,f amily and friends! Thanks to Igor, the Apache for the tips and good advice.Marina Boyko for making tutorial video for me! Rafał Rackmann, Naomi, the Blue Bear Team, Polina, Chiara, Cristina, Martin, Julia Kulagina, Ksenija, Lika, Megan, Tim, the French Team, the Spanish Team, THE POLISH TEAM, KSJ and all Asian skaters... And I could keep on writing... BIG thanks to skaters all over the World!!!! Thank you everyone!!! Without you, Freestyle slalom can't exist!